The Assembly is now a member of the Breastfeeding welcome here program. Staff at the entrance can show parents to a space where they can feed their baby. 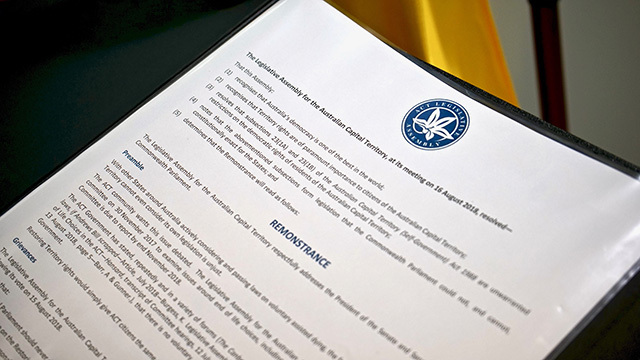 Today Joy Burch MLA, Speaker of the Legislative Assembly, formally presenedt the Assembly’s remonstrance to Senator the Hon Scott Ryan, President of the Senate, following the Senate’s rejection of a bill to allow the ACT and the Northern Territory to make laws on assisted dying. Speaker Burch was joined by representatives from the Northern Territory Parliament, who were presenting their own remonstrance on this issue. It's rare for parliaments to remonstrate (formally protest). This is the first remonstrance in the Assembly's 29 year history. Read the remonstrance motion. The Government has announced a number of Ministerial and portfolio changes along with the expansion of the Ministry. The eighth Minister will be member for Murrumbidgee, Chris Steel. Chris Steel will be Minister for City Services, Minister for Community Services and Facilities, Minister for Multicultural Affairs, and Minister for Roads. The Assembly has ‘remonstrated’ (protested) the Senate’s rejection of Territory rights to make laws on assisted dying. Remonstrance motions are rarely-used, and this is the first remonstration to pass the Assembly in its 29 year history. Watch the motion. One previous remonstrance motion was moved in the Assembly in June 2009, but this motion was amended and passed as a regular motion. The Speaker of the Assembly has farewelled ACT Auditor-General, Dr Maxine Cooper. During her seven year term, Dr Cooper has made a significant contribution to the administration and public accountability of the Territory. Media release. Candice Burch is sworn in as the new member for Kurrajong, following her election in December. Following the death of Steve Doszpot MLA, a countback of votes from the 2016 election was held on 11 December, to fill the casual vacancy in the seat of Kurrajong. This was the first countback since the 2016 election. The candidate with the most votes, Candice Burch, has been declared formally elected. She will be sworn in during the first sitting day in 2018. Speaker of the Assembly, Joy Burch MLA, as announced this year's winners of the Assembly awards for emerging artists. Media release. Steve Doszpot MLA has died after a long illness. Mr Doszpot made a valedictory statement to the Assembly on 24 October, advising his intention to resign as a member on 5 December. Mr Doszpot is the first member of the Assembly to die while in office. Speaker Joy Burch has announced the ACT's new electoral commissioner. Brigadier (Retired) Damian Cantwell AM will be appointed for a five-year term on 1 November 2017. 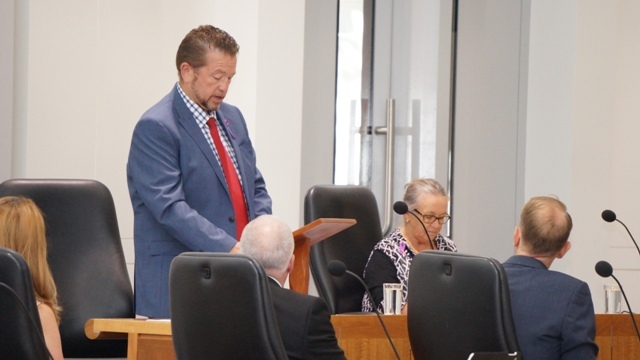 Speaker of the Assembly, Joy Burch MLA, has announced the decision of the independent legal arbiter regarding a claim of executive privilege by the Chief Minister. Media release. Phil Green, the ACT's first full-time electoral commissioner, has announced he will retire in August 2017. Speaker of the Assembly, Joy Burch MLA, has announced this year’s winners of the Assembly awards for emerging artists. Speaker of your Assembly, Mrs Vicki Dunne, has accepted an important appointment as acting Treasurer of the Commonwealth Parliamentary Association (CPA). The invitation was made in recognition of her length of service and contributions to the work of the CPA, and Mrs Dunne felt it was a great honour to be considered. The position will be filled permanently at the next meeting in Dhaka in September 2016. The first ASPG event for 2016 took place in the APH theatre. English votes for English laws. Mrs Vicki Dunne, MLA, Speaker of the Assembly, has hosted Commonwealth Day celebrations for the Assembly. Luke Gersekowski, College Captain of St Edmunds College, read the Commonwealth Day message from Her Majesty the Queen. New member for Ginninderra, Mr Jayson Hinder, has made his inaugural speech, following his swearing in this morning. Discharge Dr Bourke and Ms Fitzharris and appoint Ms Burch and Ms Porter in their places. Discharge Dr Bourke and appoint Ms Burch in his place. Discharge Ms Fitzharris and appoint Ms Burch in her place. Pursuant to standing order 223, the Speaker may approve a committee membership change if it is considered necessary for the functioning of a committee. The Speaker has formed the view that the changes support the operations of the committees concerned and has thus granted her approval. She will formally report on this when the Assembly next sits. e-Petition your Assembly – you can use an e-petition to formally request action from the Assembly. Find out more about e-petitions. Construction work has begun in the Assembly building, following the removal of the art collection for safe keeping last month. Interested in the activities of the Office of the Legislative Assembly? Our 2014-2015 annual report is now available. Signature art works in the Assembly building, including the iconic glass sculpture in the building's foyer, are being removed for safe keeping ahead of building refurbishment. Clerk of the ACT Legislative Assembly Tom Duncan Clerk has attended a benchmarking workshop for democratic parliaments, with colleagues from Asia, India, and South Asia regions. The Legislative Assembly is staging an opportunity to see behind the scenes in your Assembly building. Open day events are held once every Assembly (every four years). The Select Committee on Estimates was established in early 2015 to examine expenditure proposals put forward in the Appropriation Bill 2015-2016, the Appropriation (Office of the Legislative Assembly) Bill 2015-2016, and revenue estimates proposed by the Government in the 2015-2016 Budget. In addition to the submissions received from 15 community and industry groups, the Committee held public hearings over 11 days in June, hearing evidence from 178 witnesses across all ministerial portfolios; the officers of all Territory Owned Corporations, all ACT statutory officers, Officers of the Legislative Assembly and from community groups. Over 50 students took part in the 2015 ACT Schools Constitutional Convention on 30-21 July. The convention, a collaborative effort between the National Archives, the Museum of Australian Democracy and the ACT Legislative Assembly, aims to give students an opportunity to examine current constitutional issues and learn about the original constitution convention in the 1890s, including the modern procedures and practices of parliament. This year's students had the opportunity to investigate the Constitution and its fundamental role in Australia’s system of government; visit the Museum of Australian Democracy to part in the “Our Voices, Our Choices” interactive trail; experience the stories of those who have lobbied and petitioned to create change in the community; debate the reach of constitutional powers and the role of the Commonwealth Parliament in legislating on environmental matters; and participate in a mock referendum. The Speaker has officially received a painting, on loan from the Australian War Memorial, by acclaimed Australian war artist Will Longstaff. The painting, Villers-Bretonneux, ruins of the church, is a poignant reminder of the aftermath of a battle that forged a special bond of friendship between Australia, Britain and France. After a merit-based recruitment process the Electoral Commissioner, Phil Green, has been reappointed for a term of five years. Meeghan Fitzharris has been officially sworn in as the new member for Molonglo during the first sitting day for 2015. Ms Fitzharris won a countback to fill the seat vacated by former Chief Minister, Katy Gallagher, in December. The latest review of the implementation of Latimer House Principles in the ACT has been tabled in the Assembly by the Speaker. This report was compiled by Bill Burmester, Mark Evans, Meredith Edwards, and Richard Reid, from the Institute for Governance and Policy Analysis at the University of Canberra. Meegan Fitzharris has been announced as the new MLA for Molonglo following a countback of votes from the 2012 election by Elections ACT. Meegan Fitzharris replaces former Chief Minister, Katy Gallagher, who resigned from the Assembly in December 2014. The ACT's Lobbyist Register has come into effect. All individuals, partnerships or companies wishing to lobby a Member of the Legislative Assembly, their staff, or ACT public sector employees must now be registered. Details can be provided online, and will appear on the register, on average, within two business days of the receipt of properly completed registration forms. Online registration. The Speaker has advised the ACT Electoral Commissioner of a casual vacancy, following the official resignation of Katy Gallagher from the Assembly on 23 December. The process for filling the vacancy is managed by Elections ACT. The Speaker announced a special sitting of the Assembly today to elect a new Chief Minister, Andrew Barr MLA. The ACT's new Deputy Chief Minister is Simon Corbell MLA. Last week Katy Gallagher MLA announced that she would resign her position as Chief Minister. Lots of things happen behind the scenes at the Assembly to formalise this. Ms Gallagher is due to formally resign as Chief Minister on 10 December 2014 by providing written advice to the Speaker, Vicki Dunne MLA. Once this has happened, the Speaker will call a special sitting of the Assembly to elect a new Chief Minister. In addition to resigning as Chief Minister, Ms Gallagher has indicated that she will resign her position as an MLA before Christmas. This will create a vacancy in the Assembly that will be filled by count back of the votes from the last election. Learn more about how these processes work. In a significant reaffirmation of the independence of the Legislative Assembly, Vicki Dunne MLA, Speaker of the Assembly, tabled a set of budget protocols for the Office of the Legislative Assembly. A condolence book, located in the public entrance of the Assembly building, was opened for people wanting to pay their respects to victims of Flight MH17. New Administrative Arrangements 2014 have been notified following the announcement of the expanded Cabinet. See the new Ministerial Responsibilities. The Select Committee into Amendments to the Electoral Act 1992 has finalised its inquiry into Amendments to the Electoral Act 1992 and released its report. Vicki Dunne MLA, Speaker of the Legislative Assembly, has welcomed the arrival at the Assembly of an important piece of Australian art history. The painting has been loaned to the Assembly as part of the commemoration of the centenary of World War I. Villers-Bretonneux, ruins of the church by William Longstaff, is on display outside of the Speaker’s hospitality room at the Assembly building. The Speaker extended her thanks to the Australian War Memorial and its Director, Dr Brendan Nelson, for the generous loan. Since occupying the iconic South Building on London Circuit in 1994, the Assembly has developed a collection of visual art that reflects the calibre and diversity of artists working in the region. Acquisitions are made each year on the advice of the Legislative Assembly Art Advisory Committee, and new works are displayed temporarily on the ground floor corridor of the Assembly building facing London Circuit. Explore a selection of works in our online gallery. Today we recognised the years of service of our longest standing staff members. Commencing for the sitting week of 8 April, Question Time and adjournment debates will now be replayed on community radio station ArtSound FM. Canberra's centenary time capsule was sealed on City Hill this week. Our gifts to future Canberras included copies of speeches from Canberra's 100th birthday, and handwritten letters from Assembly Speaker, Vicki Dunne; Chief Minister, Katy Gallagher; ACT Opposition Leader, Jeremy Hanson; and Greens Leader, Shane Rattenbury. Dr Ken Crispin QC is announced as the inaugural Legislative Assembly Commissioner for Standards. On Wednesday 4 December 2013, the Speaker, Vicki Dunne MLA, welcomed guests from across the ACT arts community and beyond to the official handing over of the ‘Great Centenary Tapestry’. The Speaker, Vicki Dunne MLA, has announced the latest recipients of the Assembly's art prizes. The Assembly has resolved that a Commissioner for Standards be appointed. The position will be filled for an initial period of two years. The 2012-13 Annual Report for the Office of the Legislative Assembly is now available online.